Under normal conditions, root canal therapy can save a tooth from extraction. However, when this non-surgical procedure fails to completely heal your tooth — your Holland Endodontist may recommend surgery. Endodontic surgery allows Dr. Buurma to locate painful fractures or hidden canals that do not appear on x-rays, and can help repair damaged root surfaces or surrounding bone. The most common surgical procedure we perform to save damaged teeth is called an apicoectomy, also known as apical surgery or a root-end resection. If an apicoectomy is necessary, Dr. Buurma will make a small incision in your gum tissue to expose the bone and surrounding inflammation. He will then remove the damaged tissue along with the end of the root tip. To prevent reinfection of the root and gums, a root-end filling will be sutured into place. After several months, the bone will naturally heal around the root and restore full function. Before our staff begins any surgical the procedure, a thorough examination and diagnosis will be performed. We will always explain the process and then request both verbal and written consent before we proceed. Our caring staff will also provide you with medication to ease your post-surgical pain that will also allow you to return home that same day. Many patients experience minor swelling, bruising and numbness after the procedure. We will contact you the day after your procedure and we will continue to follow your progress carefully until healing is complete. If you would like to know more about endodontic surgery, Dr. Buurma and his staff can help you understand your options and choose the best solution. 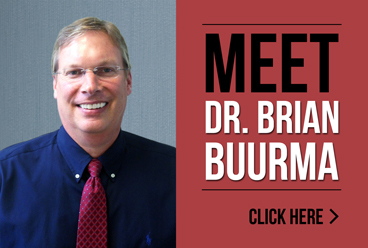 For more information about Brian Buurma DDS or endodontic surgery, please contact our office or call us directly at 616.994.9722.